Julia Aks, Zachary Ford and the cast of Oklahoma! Just when you thought you knew what the Rodgers & Hammerstein musical Oklahoma! was all about, along comes a revival by 3-D Theatricals that makes you rethink everything. 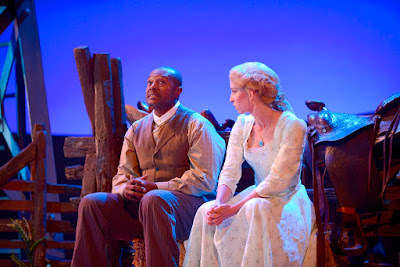 Yes, it will always be the story of a headstrong young farm girl and a charismatic cowboy whose romance is challenged by a menacing hired hand, but there is another layer to it I’ve never seen emphasized in any other production; Oklahoma’s ethnic makeup at the time and how it may have impacted those who lived there. 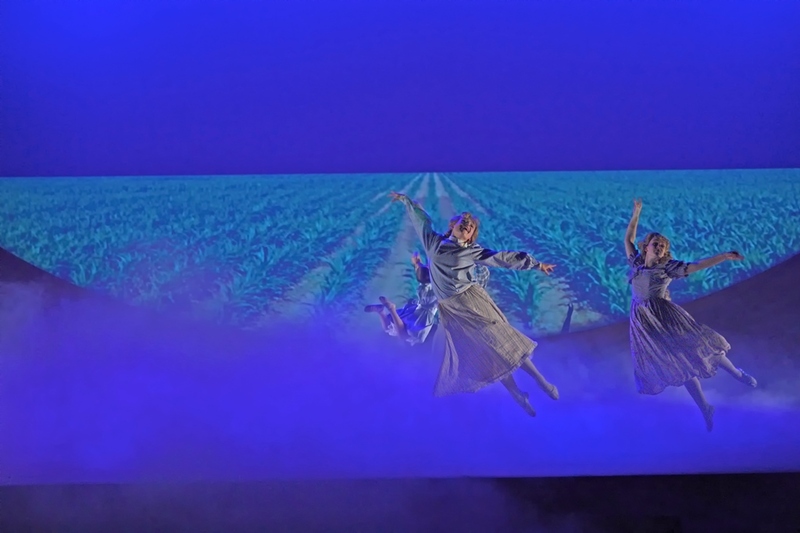 The musical is set in the days leading up to Oklahoma’s bid for statehood in the early 1900s and is based on Lynn Riggs’ play Green Grow the Lilacs. 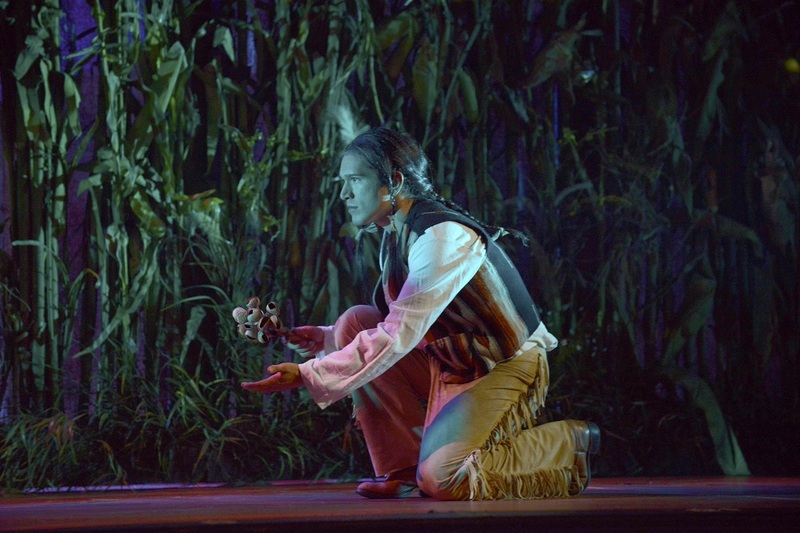 Riggs grew up on a farm near Claremore, Oklahoma (the same Claremore mentioned in the musical) in what was then known as Indian Territory so it is natural he would recreate the world of his youth for this particular story. The eastern part of the state had been set aside by the U.S. government for the relocation of Native Americans whom the Feds had evicted from their lands. It was also where many African Americans, some free and some still enslaved, occupied towns alongside immigrant settlers. Whether farmers or cattlemen (or black, brown, or white), to live here was to be committed to the hard work necessary to make the harsh surroundings habitable. Survival meant learning to get along, though one can imagine the tensions that might have arisen in such a melting pot. This is the landscape for director T.J. Dawson’s revival, one that creates a vital new narrative in the wake of contemporary racial and political tensions. 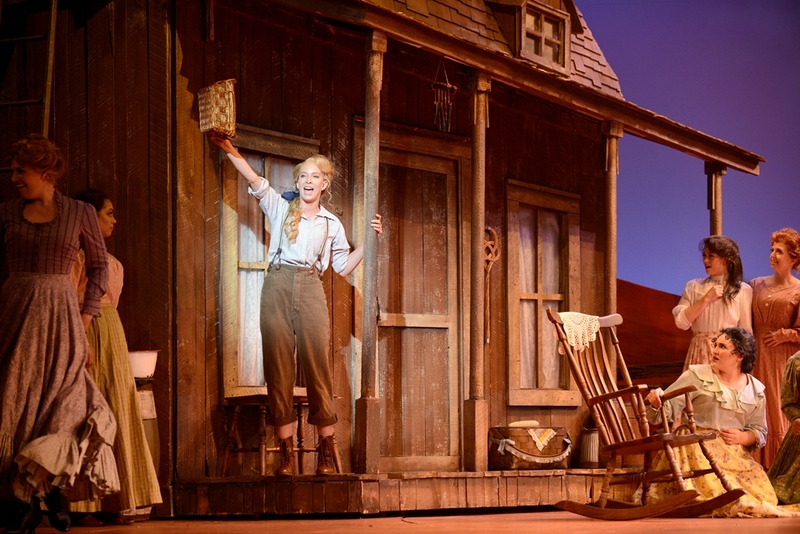 Against this backdrop, Laurey (Julia Aks) is no shrinking flower but a hardy young woman who takes the demanding work of running a farm seriously. Her standoffishness with Curly (Zachary Ford) lasts longer than usual, and verges on becoming unlikable, but it is grounded in a reality that is believable, making her eventual admission that she needs him a powerful turn. It doesn’t happen until the box social but, when it does, the payoff is a satisfying one. Ford’s Curly isn’t the typical self-assured leading man you’re used to seeing either. When he and Aks engage in their Beatrice and Benedick style sparring, a boyish vulnerability is evident behind the mischief. He may be confident on the surface but casting a character leading man instead of the usual baritone romancer means you’re going to see an unpredictable Curly with the potential to make some extremely affecting choices, which Ford does. Plus, he gets more mileage out of the humor in the libretto. Dawson’s critical decision to cast Rufus Bonds, Jr. as Jud Fry – were it done in the context of non-traditional casting – wouldn’t be so unusual, but that’s not the purpose here. Borrowing from a line in both the musical and the play referring to Jud as “bullet-colored” he is intentionally presenting a world in which a man of color could legitimately find himself in this story. Bonds doesn’t waste the moment. He reinvents the character with remarkable insight into his humanity and, in doing so, gives us an opportunity to see our own human failings in the process. 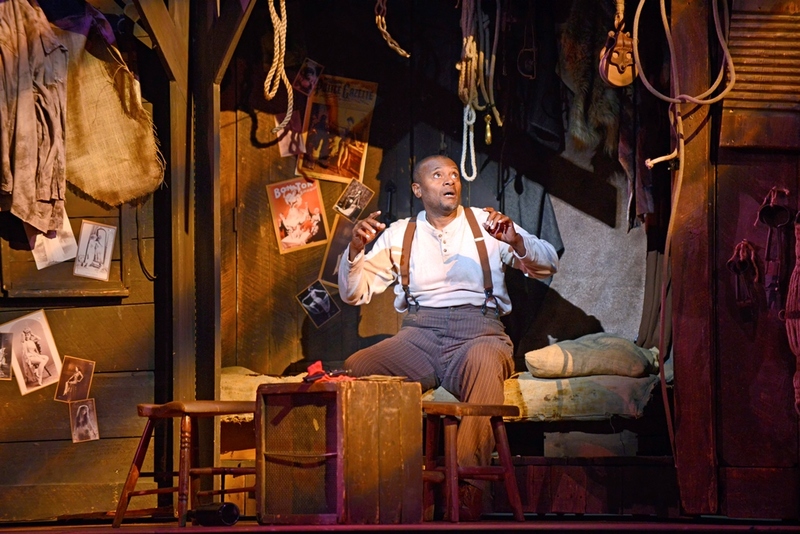 Now when Curly picks up a rope in Jud’s room and jokes about how easy it would be for a man to hang himself from the beam above them, we are eerily reminded that, throughout our history, something as simple as the color of a man’s skin could get him killed. If that’s not relevant to today, I don’t know what is. Taking a page from the Agnes de Mille philosophy of dance, which uses the art form to further the storyline, Leslie Stevens choreographs two bona fide showstoppers. Her staging of the Dream Ballet is fifteen minutes of searing emotion – joy, pain, lust, innocence, horror – and it’s a knockout. She expands the story even beyond what de Mille first presented as Laurey struggles to make up her mind in a dream turned nightmare. 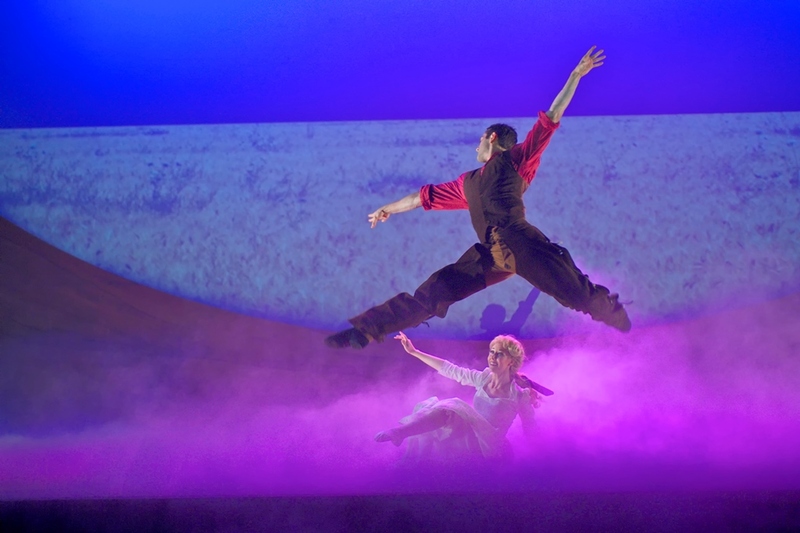 This is a career milestone for Stevens whose dancers, like Missy Marion and Dustin True, (Dream Laurey and Curly) elevate the soul of the production with their technical skill. 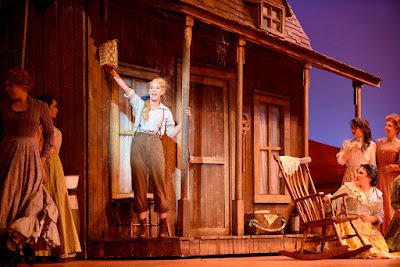 Then, after intermission she does it again with an athletic, exuberant ensemble number for the entire 53-member cast in “The Farmer and the Cowman,” a competition of one-upmanship that builds to a breathless climax. Musical director Julie Lamoureux accomplishes the same feat musically in the large choral numbers and her 23-piece orchestra spins one of the most beautiful scores to come out of the Golden Age into gold. 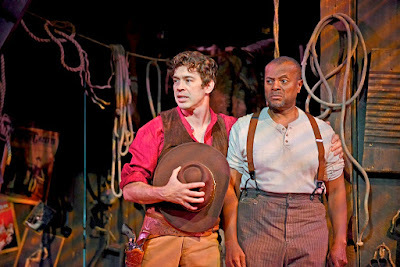 Forget third time’s a charm; for Richard Rodgers and Oscar Hammerstein II, their first time changed the game for the entire musical theatre genre, and this is a chance to hear the full power of Rodgers’ angelic harmonies that so beautifully defined the movie musical period of the forties and fifties. 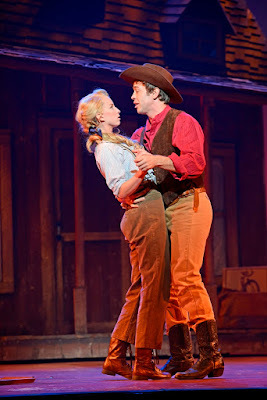 In any production it’s always a toss-up whether Will Parker or Ado Annie (played by Tom Berklund and Kelly Dorney) will be the dumber of the two comic roles but here they rival each other for the title. Neither develops beyond on a single overriding character choice pushed to the extreme, although Berklund’s dancing is so brilliantly executed it almost doesn’t matter. Ali Hakim (Drew Boudreau) and Aunt Eller (Tracy Rowe Mutz) are high energy roles that still leave themselves someplace to go within all the melodrama. 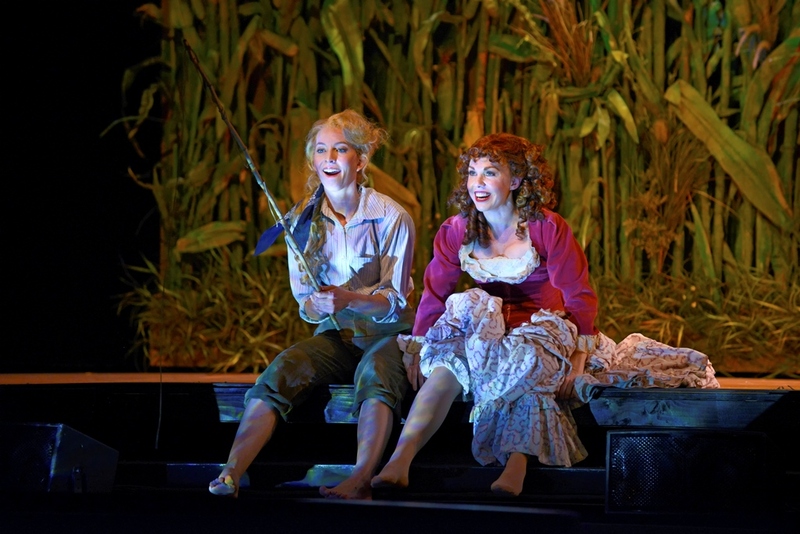 3-D Theatricals always over-delivers on the technical aspects of its productions and this show doesn’t disappoint. 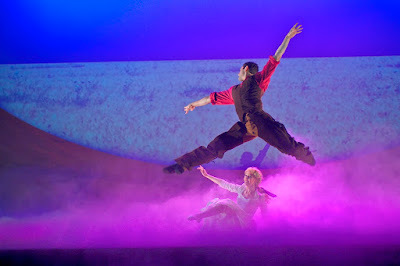 Jean-Yves Tessier’s lighting at the fish pond and inside Jud’s smokehouse makes the moments seem particularly intimate, in sharp contrast to the bold colors he uses to flood the stage during the Dream Ballet’s dramatic shifts. 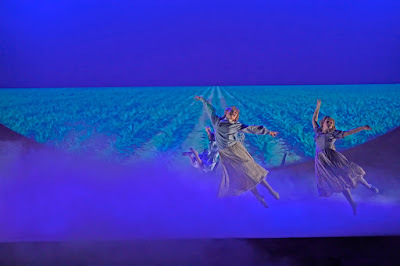 Andrew Nagy’s projections enhance the feeling of great open space on the prairie (but for a little overkill on the birds flying by) and in a creative decision that might escape notice anywhere else, Peter Herman’s long side-swept ponytail for Laurey makes exactly the right character statement. 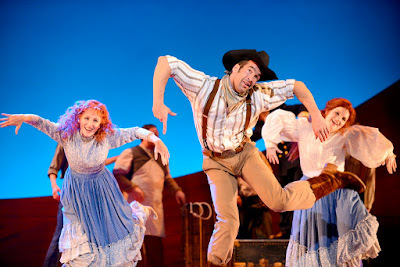 There is an unparalleled thrill that occurs when a director takes a well-known musical like Oklahoma! and finds what others have missed, especially when it was there all along. 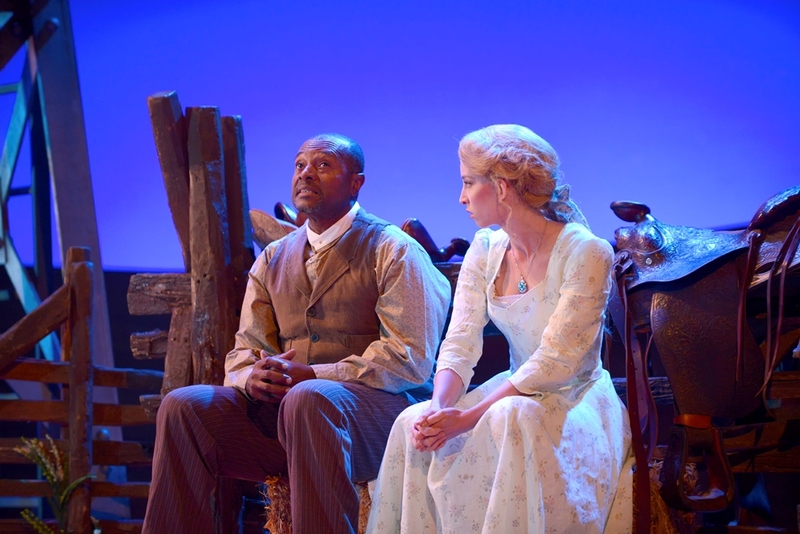 T.J. Dawson’s thoughtful undertaking of the search to answer the question, “Why Oklahoma! 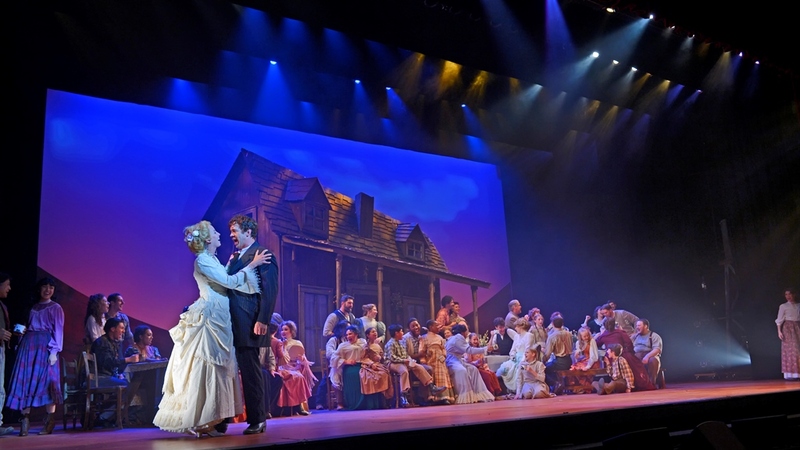 and why now?” proves classic productions can be as significant today as when they were first written. It’s all in how you see it. Zachary Ford and Rufus Bonds, Jr.